As we move into the Holiday season, I’m feeling like taking the scenic route here. I’m waiting for a few ingredients to come into season for the next dish I’m aiming at, so I have some time and space to play around. I’ve become addicted to the ChefSteps videos; a recent one in which they make a ganache from corn (exploring the use of amylase to convert starch to sugar) piqued my curiosity and I wanted to play with it. I used a similar technique to see if I could make Sweet Pea ganache. 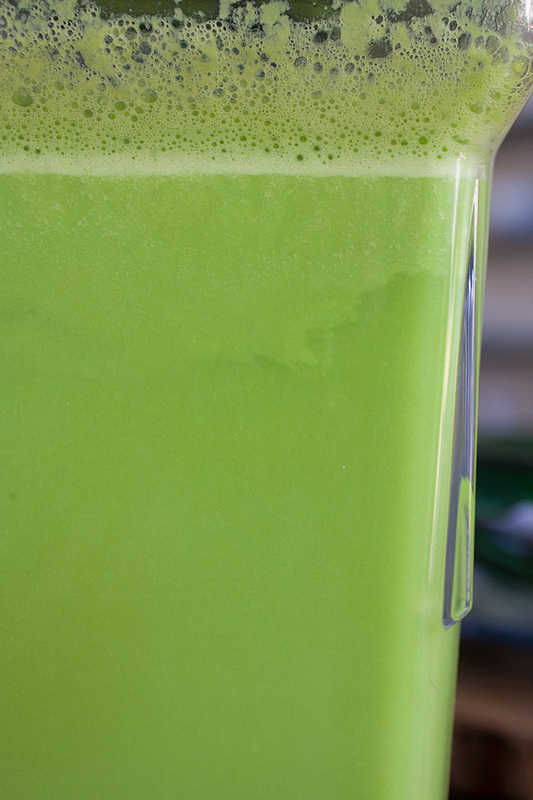 I followed more or less the same recipe they mention; I adjusted the water because peas are quite a bit starchier than corn and the resulting blended pea puree was too thick to properly separate. After about an hour and a half, I could see some separation happening, so I strained the puree through cheesecloth, then reduced it to a thick syrup before adding some cream and butter. The resulting ganache is really tasty! It has a slight ‘chalky’ mouthfeel, an indication that there are still large starch granules that didn’t get converted by the amylase, and as a result the ganache isn’t as sweet as I’d expected, but it’s still tasty and very pretty. I’ve finished reading the Modernist Cuisine books, and my head is swimming with ideas from it that I’d like to play with as well. 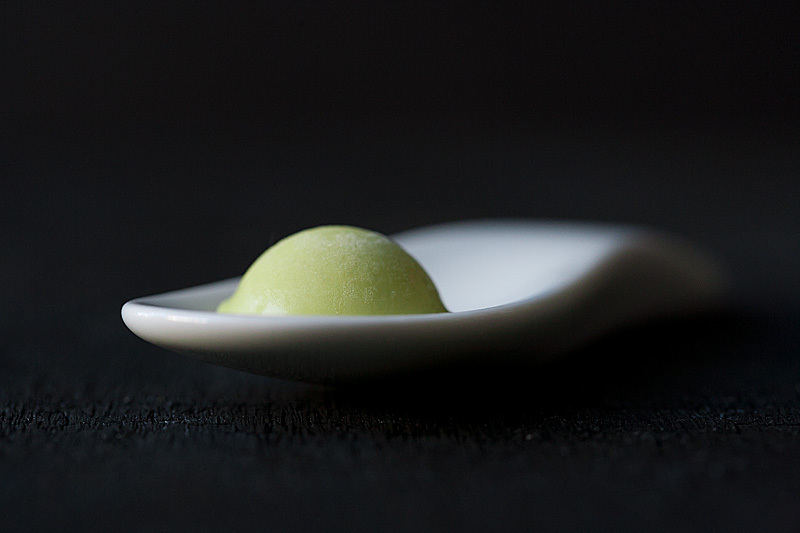 I’m looking for ways to adapt the next Alinea recipe I work on to give me the opportunity to try some new stuff without totally departing from the character of the dish itself. A few weeks ago, Rene Redzepi came to San Fran to promote his new books. His talk was interesting and well-presented; it focused largely on creativity, and highlighted Noma’s cooking over the past couple of years as he and his team have tried to maintain creativity in the face of success. The first Noma book is inspiring but intimidating in its scope, mostly because of the extreme locality of the ingredients used. The cookbook included with his latest release is no different. It’s just as pretty and inspiring as well. Flipping through it, one simple dish caught my eye just because it was so visually striking. Redzepi explained one of the themes of creativity at Noma is “trash cooking”: how can they find new and interesting ways to utilize products that are usually discarded? 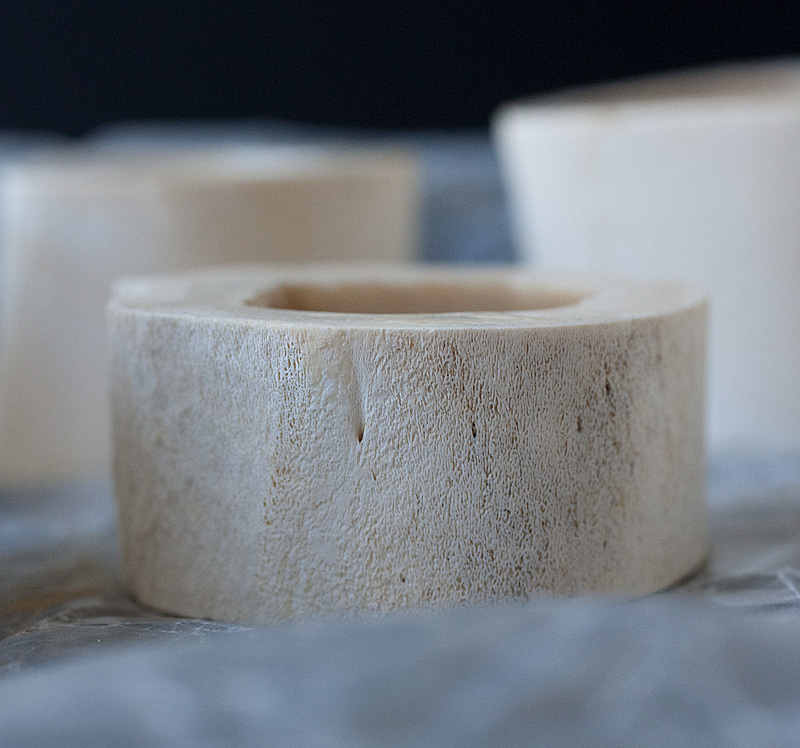 While many would argue that throwing away bone marrow is flat-out ridiculous, the theme of highlighting lowly things like bones still shines through in the final presentation. It seemed like a good afternoon project, so I thought I’d give it a shot. I bought several packs of frozen marrow bones from Whole Foods, got home and realized I didn’t really know what to do with them. 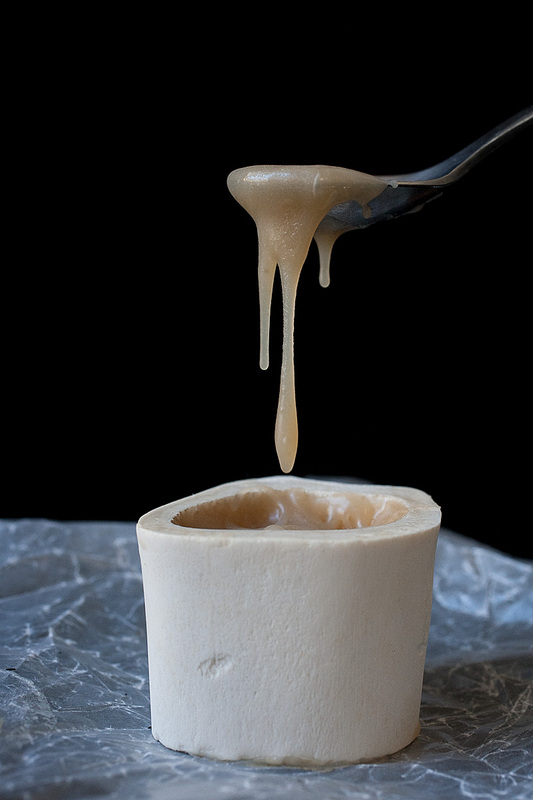 The French Laundry Cookbook suggests soaking the marrow bones in ice water for 20 minutes or so, then pushing the marrow plug out of the bone with your thumb. 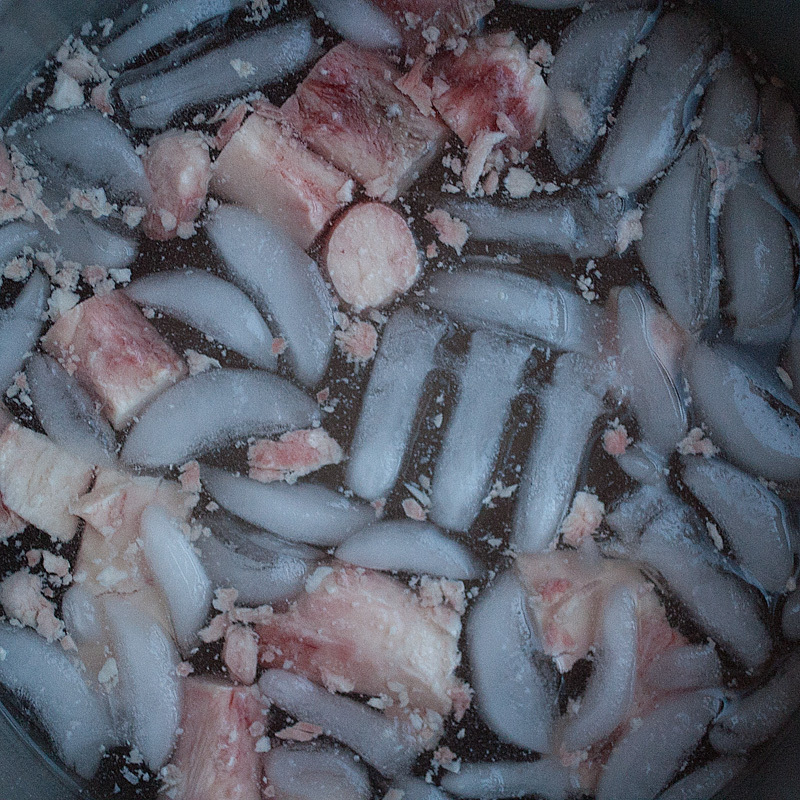 Because marrow is mostly fat, it doesn’t freeze the way water does, but remains firm bit pliable when frozen. Pushing it out of the bones was surprisingly straightforward. I then transferred the marrow to another batch of ice water to let it soak for several hours. The slow soak leeches blood from the marrow, removing most of the pink hue (and the metallic taste that would come with it). I exchanged the water every 8 hours or so for a couple of days, until it remained clear and the marrow was nearly white. The marrow is then smoked. 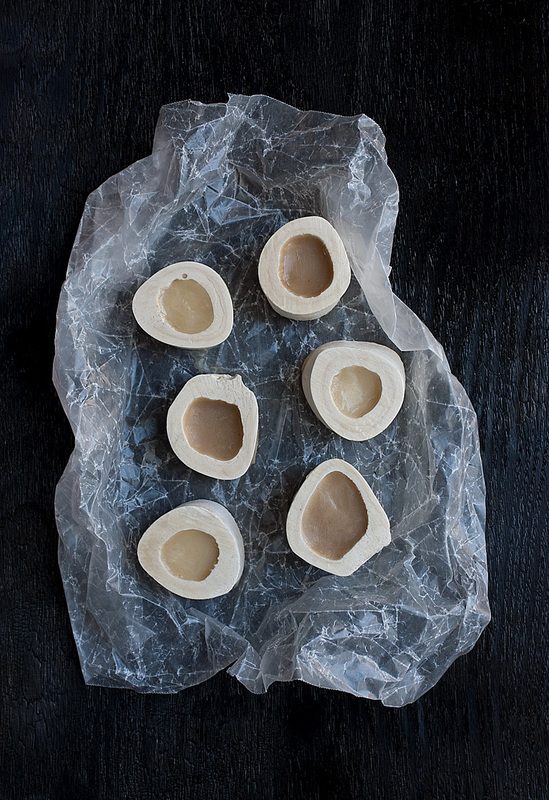 There are no instructions on this in the Noma book; the recipe just calls for “smoked bone marrow”. We recently got a smoker and I’m totally obsessed with smoking anything and everything on it. I put all the marrow lumps into a disposable aluminum tray and tucked it into the smoker. Once it was in the smoker, I realized I had no real idea what I was doing. 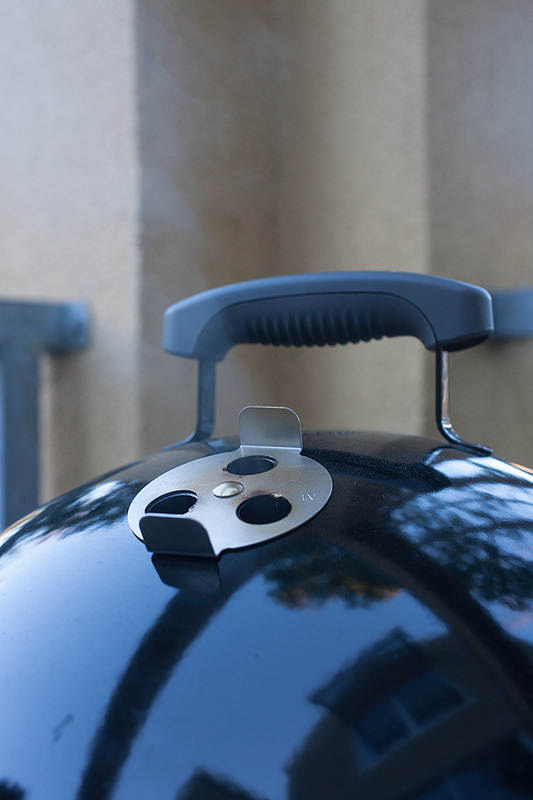 Smoking something is a tricky business; you’re basically doing two things at once: the heat of the smoker cooks the food, while the smoke itself is flavors it. The smoke and heat are inextricably linked…too high heat causes the smoke to turn acrid, too low and the smoke is anemic. The best (read: most expensive) smokers find ways to unlink these two elements, providing independent control over each. Inexpensive or traditional smokers leave this job up to the pitmaster (or, in my case, pitapprentice). I had no idea what temperature I needed to cook the marrow at, nor how long it needed to smoke. So, as I do with most things in life, I started by just turning everything all the way up. I smoked the marrow at 225F until the wood chunks had given out all their smoke, which took about 2 hours. The marrow mostly melted, and took on a dark smoky appearance. While the marrow was smoking, I worked on cleaning the bones. Again, I had no idea how to do this. I boiled them to try to soften the meat scraps attached to them. This sorta worked. I pressure-cooked them for a few hours. This seemed to help too, the remaining meat scraps pulled right off. I slow-cooked them overnight in some vinegar. This whitened them a bit. 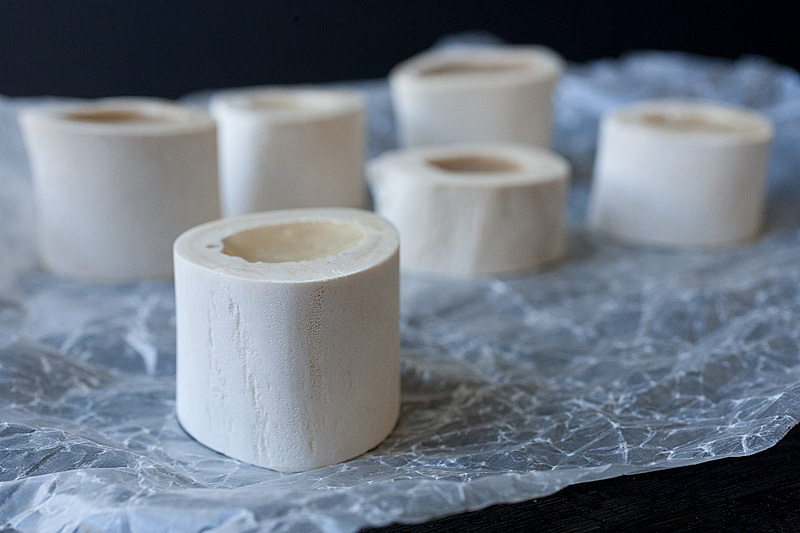 I dried them out in the oven until they were…ahem…literally bone-dry. I sanded them with a random orbital sander. I chiseled out sharp bits from the inside. It was obviously a highly-scientific process. But in the end, the bones looked nice and boney. To make the fudge, I brought a mixture of sugar, cream, glucose and salt up to 226F, then added the bone marrow and some butter, whisking to emulsify them. The recipe calls for apple balsamic vinegar; I don’t have any on hand, but do have some pear balsamic, as well as some lovely chocolate balsamic that my lovely friend Kate gave me recently. Because I had enough marrow for two batches, I tried using both balsamics to see if I could tell a difference. When the fudge had cooled, I tasted it. It tasted overwhelmingly like licking burnt wood. I had totally oversmoked it to the max so hard. 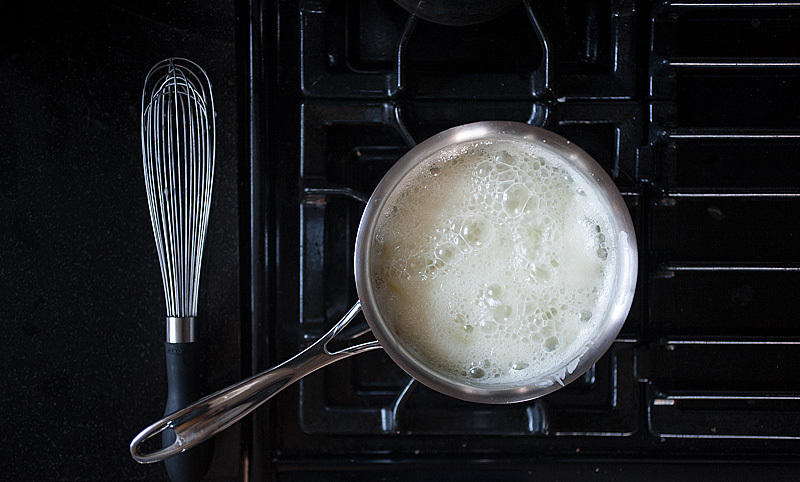 None of the nuances of the vinegars or the slightly nutty character of the cooked cream were at all discernable. The texture was nice, so it had that going for it. But it was largely inedible otherwise. So, I scrapped it, waited a week until I had another chunk of time to play with my smoker, and tried again. 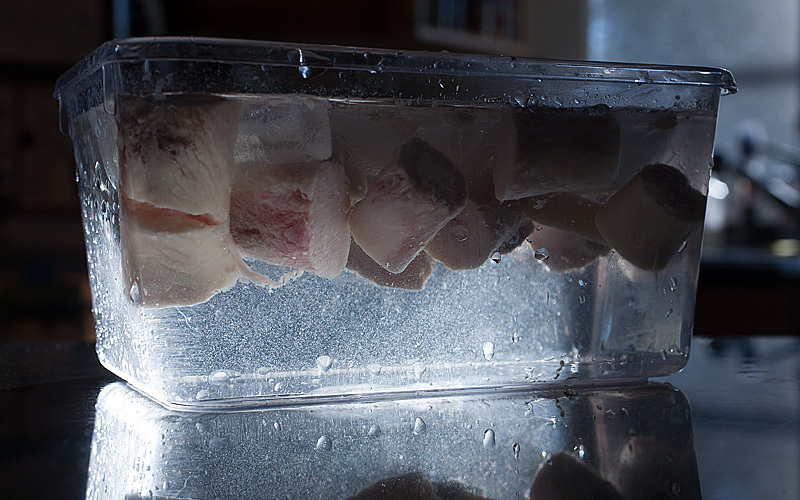 I read a bit about smoking bone marrow; many recipes do it on a grill for around 20 minutes. I figured maybe I should dial back my Hulk Smoking tactics a little. I smoked another batch of cleaned marrow at around 175F for 20 minutes, then tried making the fudge again. It was still notably smoky, but milder, way less bitter. I would say it’s better, maybe still not as nuanced as I’d like. I’m surprised at how acutely fat absorbs aromas and flavors; I’ve read about how butter readily absorbs refrigerator odors and aromatic herbs, but the rapidity at which the marrow took on deep smoke flavors struck me as dramatic and interesting. I wonder if maybe using a smoking gun would give you the right amount of smoke? I use mine all the time to smoke butter and works really well and doesn’t take to long. Maybe use cherry wood that wouldn’t be as assertive? Great post as usual!